Leonid Kogan, a preeminent Soviet violinist of the 20th century, performs Zigeunerweisen (Gypsy Airs), Op. 20, a musical composition for violin and orchestra written in 1878 by the Spanish composer Pablo de Sarasate. The work is based on themes of the Roma people, and in the last section the rhythms of the csárdás; this section uses a theme previously used in Franz Liszt’s Hungarian Rhapsody No. 13, composed in 1847. It is one of Sarasate’s most popular compositions and a favorite among violin virtuosas/virtuosos. Un poco più lento – The muted soloist plays a melancholic melody with the so-called reverse-applied dotted note (1/16 + dotted 1/8 rhythm), akin to the “Mannheim sigh” of the classical era; in 2/4 time. Leonid Borisovich Kogan (November 14, 1924 – December 17, 1982) was born in a Jewish family in Dnipropetrovsk, Ukraine, the son of a photographer who was also an amateur violinist. 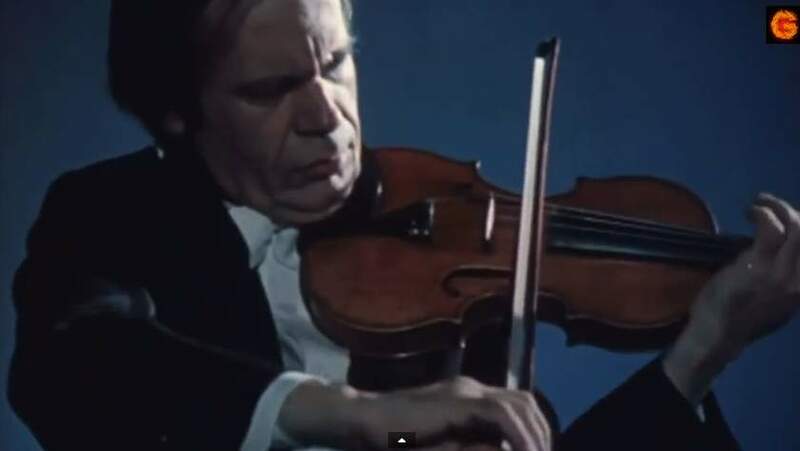 After showing an early interest and ability for violin playing, his family moved to Moscow, where he became a pupil of Abram Yampolsky, first at the Central Music School and later at the Conservatory (1943-48); subsequently pursued postgraduate studies with him (1948-51). In 1947 he was a co-winner of the 1st prize at the World Festival of Democratic Youth in Prague; then won 1st prize in the Queen Elisabeth of Belgium Competition in Brussels in 1951. His career was instantly assured; he played in Europe to unanimous acclaim. He made an auspicious American debut playing the Brahms Violin Concerto with Monteux and the Boston Symphony Orchestra on Jan. 10, 1958. In 1952 he joined the faculty of the Moscow Conservatory; was named professor in 1963 and head of the violin department in 1969. In 1965 he received the Lenin Prize. His playing exemplified the finest qualities of the Russian School: an emotionally romantic elan and melodious filigree of technical detail. In addition to the standard repertoire, in which he excelled, he also played modern violin works, particularly those by Soviet composers. He married Elizabeth Gilels (sister of pianist Emil Gilels), also a concert violinist. His son, Pavel Kogan (b. 1952) became a famous violinist and conductor. His daughter, Nina Kogan (b. 1954), is a concert pianist and became the accompanist and sonata partner of her father at an early age. Kogan died of a heart attack in the city of Mytishchi, while travelling by train between Moscow and Yaroslavl to a concert he was to perform with his son. Two days before, he had played the Beethoven Concerto in Vienna. Many speculate that Kogan played on all steel strings, though there is not an outright confirmation. While his close associates indicate he played on gut strings with a steel ‘e’, it is most likely that he used different combinations over the course of his career. Kogan used two Guarneri del Gesù violins: the 1726 ex-Colin and the 1733 ex-Burmester. He used French bows by Dominique Peccatte. Kogan never actually owned these instruments; they were provided on loan from the Soviet government. Today they are worth more than $4 million USD.